Continental ContiSportContact tires are a high performance summer tire that fills a need for those looking for a quality made tire that also delivers on the street. One testament to the performance of this particular tire is that it is approved for use as original equipment on the Porsche 911. 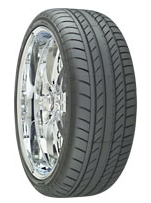 The tire itself features an asymmetric tread design and comes in W and Z speed ratings. Circumferential grooves and continuous center ribs give the tire enhanced performance and strength, to go along with improved wet pavement handling. Two steel belts that are nylon reinforced help provide high speed driving and handling. While this tire has been improved on with the release of the 2nd generation ContiSportContact model, it still is a good tire that continues to do very well on the market. Prices on the Conti Sport Contact tires range from a low of around $210 for the 16 inch series tire, to upwards of $340 or so for the larger 19 inch models. Who Are Continental ContiSportContact Tires Designed For? Continental has designed the ContiSportContact tire for sport coupes and sedans for drivers who are seeking a tire with predictable dry road traction and solid overall cornering and handling. Continental Tires does not provide for a treadlife warranty on the ContiSportContact tire. They do however include a one-year or first 2/32 inch of wear on the tire’s uniformity. Materials and workmanship is covered for 6 full years and gives you a free replacement during the first year or first 2/32 inch of wear, followed by a prorated amount for the remaining time period down to the final 2/32 inch of useable tread left on the tire. Finally, Continental also includes a 1 year or first 2/32 inch of wear road hazard warranty. All sales of this tire have a 30-day customer satisfaction guarantee. If you do not like the tire you can exchange it for another Continental tire model.